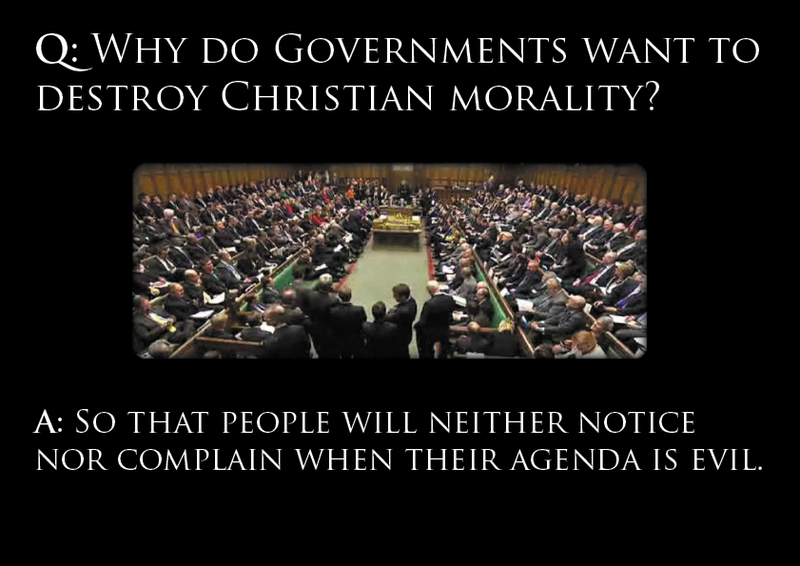 Why Do Governments Want to Destroy Christian Morality? So that the State becomes all-powerful - the determiner of morality, and the bestower/imposer of awards/penalties according as people comply or fail to comply with the dictates of the State's morality. Without Christianity, the acceptance of objective moral reality can be more readily eliminated among the People, and with it the knowledge, will and spirit to resist the arbitrary demands of the State impinging on the most fundamental nature of the person. Attacking Christianity, weakens the Church, and the natural institutions that Christianity fosters, marriage, the family and the nation, which are all natural bulwarks against totalitarianism. Bingo! Couldn't have said it better myself. I despair. Where do they say that it is against God's law? Linen on the Hedgerow has a good headline of 'Bishops attack with a feather duster.' Exactly. Why are they afraid of telling us the truth? One of Hitler's earliest actions was to remove the right of conscientious objection in the German Military Code. Nobody objected as of course no German officer would ever issue a command to do something immoral. Soon we will be told that we have to accept gay marriages in our Churches and our right to object will be removed. Off topic, but what I'm dying to see is the Tablet's response. What is the matter with Archbishop Nichols?? His behaviour is comparable to Archbishop Martin in Dublin. They speak like secular politicians or diplomats with a little bit of superficial, vague, inoffensive "Christianity" thrown in. Surely they ought to resign and go work for the UN or some such organisation which would really appreciate their relativistic-type of philosophy? God forgive me. I do pray for them, but they do do much harm to souls and our beloved Church, more by their omissions than commissions that it breaks my heart! How can we just ignore this? Blessed Michael, the Archangel, defend our Bishops and priests against Satan.